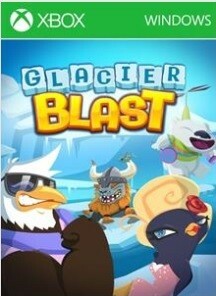 Now available for Windows 8, is a new Xbox enabled game from Microsoft Studio’s, titled Glacier Blast! 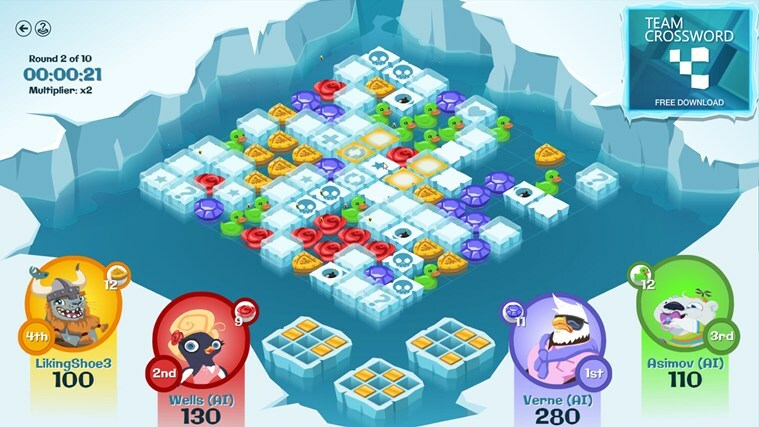 Glacier Blast is an exciting and free turn-based multiplayer puzzler, with a cartoony flavor and endless possibilities! Check it out in full detail and head past the break to download for FREE and start earning those Xbox achievements today!! Glacier Blast is about blasting glaciers away! Choose from a set of strategically-organized ice breakers, and drag them over a cluster of ice tiles. Once dropped, they destroy the targeted tiles. Choose wisely. The more effective your move is, the more points you rake in! Avoid dropping ice breakers in water to get the highest score! Need to plan before making a move? Feud match combines strategy and quick play! Want an intense 5 minutes match? The fast-paced Quick Feud is for you! Looking for a moment of peace? The Puzzle mode is a smooth-paced single player game. Destroy the whole board in the smallest number of moves. Meet four wacky furry friends that’ll accompany you through your adventure! 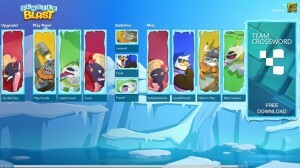 Fully animated, they react to how you play as well as to various events throughout the game. Infinite challenges! Randomly generated boards never let you play the same game twice! Log in via Xbox to earn achievements and see how fast you can climb the leaderboard! Play in multiplayer mode with up to 3 friends per match! Rapidly play any Feud match with your friends, by selecting them from your friend list. 40 puzzles. That should keep you busy for a while! The game compiles your game statistics! Keep an eye out for them. No friends online to play with? Don’t worry, we’ll make some computer friends for you. And they are tough to beat. Play the Puzzle mode while offline, sync your progression via your account later! Choose between touch-screen controls, or mouse & keyboard. Tired of the ads? You may disable them for a small fee! Download this awesome game FREE game today!